Background: By tradition, the postaural incision is closed in single or multiple layers. In this study single layer closure is compared with multiple layer closure. Materials and Methods: Two hundred patients with Chronic suppurative otitis media undergoing ear surgery by post aural approach at our department were included in the study. Results: It was observed that time taken for single layer closure was far less compared with time taken for multiple layer closure, which was of statistical significance. Conclusion: single layer closure is as effective as multiple layer closure of postaural incision, with the distinct advantages of reduced closure time and lesser cost of suture material. By tradition, the postaural incision is closed in two or three layers. The layers consisting of periosteum, soft-tissue, and skin, each layer being closed separately. It not only consumes more of suture material, but also plenty of surgeon's time, sometimes the time for suturing equals or exceeds the time taken for mastoidectomy or tympanoplasty. The postaural incision closure can also be done in a single layer. Here, only the soft tissues and skin are sutured in a single layer. It saves both time and suture material, thereby reducing the cost of surgery as well. We did a random search on the internet to find out the efficacy of either of the procedures and to our surprise did not find any. Hence this study was undertaken to study and compare the efficacy of closing the postaural incision in a single layer versus closing in multiple layers. The present study - postaural incision closure in single layer versus multiple layers: a comparison - was conducted in the Department of Otorhinolaryngology, Fr. Muller Medical College Hospital, Mangalore from April 2010 to January 2012. Data was sourced from patients who attended the outpatient department of Otorhinolaryngology, Fr. Muller Medical College Hospital, and who were diagnosed to have chronic suppurative otitis media, either tubo-tympanic or attico-antral type. The study included 200 cases of chronic suppurative otitis media (CSOM) who underwent mastoidectomy/tympanoplasty via the postaural approach. They were randomly divided into two groups of 100 each. The incision in first group (group I) was closed in a single layer. The incision in the second group (group II) was closed in multiple layers. Patients who were diagnosed to have CSOM-tubotympanic or atticoantral type in the age group of 6-60 years and who underwent surgery via the postaural approach were included in this study. Patients with co-morbidities like diabetes and hypertension were excluded. Patients undergoing surgery via the endaural or endomeatal approach, as well as patients undergoing revision surgery were also excluded from the study. A total of 200 patients who were operated for CSOM, both tubotymapnic and atticoantral disease, were included in this study. All patients were randomly divided into two groups, group 1 and group 2. The surgeries performed included tympanoplasty, cortical mastoidectomy with tympanoplasty and modified radical mastoidectomies. All surgeries were done via the postaural approach using the William Wilde's incision. The patients were admitted one day prior to surgery. All routine blood investigations were done. Patients who had co-morbodities like diabetes and hypertension were not included in the study. All patients were started on antibiotics (Amoxycillin + Cloxacillin), antihistamine-decongestant (Ebastine + Phenylephrine), and a multivitamin on the previous night of surgery. All surgeries were done under general anesthesia. After infiltration, a standard postaural incision was made 5 mm behind the postaural groove using a BP knife (No. 15). The incision extended from mastoid tip till about 1 cm above the attachment of pinna. The incision was deepened, the temporalis fascia graft harvested, and the proposed surgery was carried out. The incision in group 1 patients was closed in a single layer. Here the mastoid periostium was left in place, only the soft tissues and skin were sutured in a single mattress layer using 2.0 Ethilon. The first bite was taken deep (about 7-8 mm away from the incision margin). The second bite was superficial, close to the skin margin [Figure 1]. The first knot was a double knot, flowed by three or four simple knots. 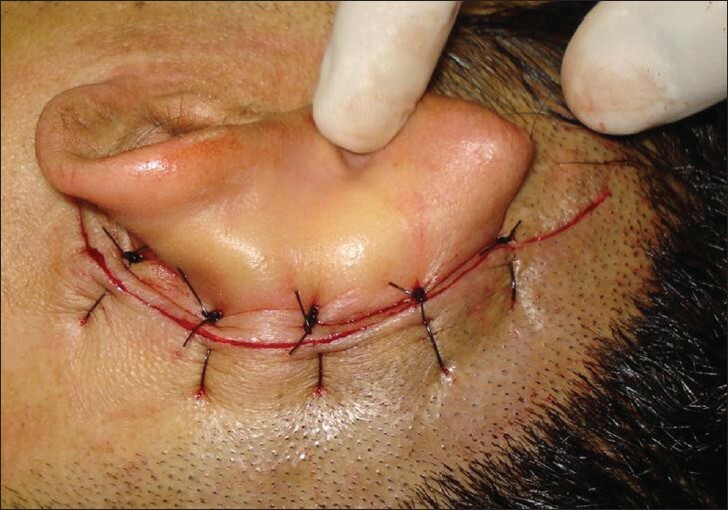 Five to six sutures were placed at a distance of approximately 1 cm. In group 2, the incision was closed in three layers. The first layer (periostium) and second layer (soft-tissue) were closed in separately using simple sutures with 3.0 Vicryl. 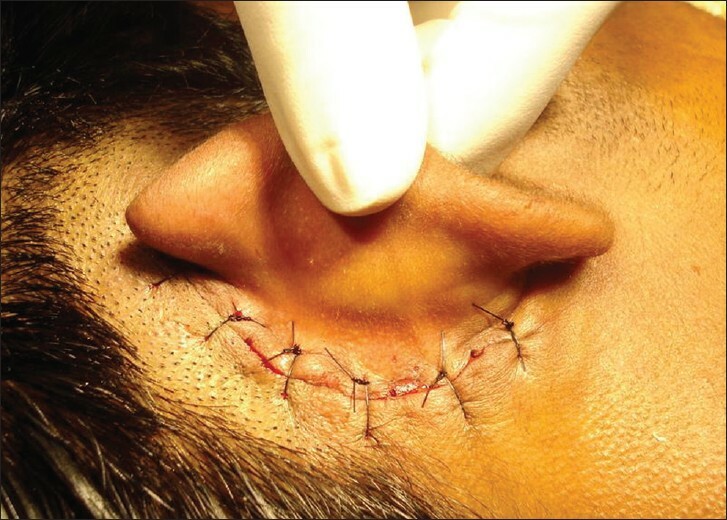 Skin was closed with 3.0 Ethilon in simple sutures [Figure 2]. About six to seven sutures were applied. Once the closure was complete, the wound was cleaned with Betadine, smeared with Neosporin ointment, and a mastoid dressing was applied. The mastoid dressing was changed on the first postoperative day and the sutures were removed on the seventh postoperative day. Antibiotics were given for a total period of 2 weeks in both the groups. The wound was checked for approximation of the skin margins, any skin overlap, dehiscence, discharge, and collection. Patients were followed up every 2 weeks after suture removal for 2 months. It was found that majority of patients who underwent surgery were in the third decade of life (35.5%) [Table 1]. A male preponderance was noticed in this study; 56% were males (112 patients) as compared with 44% females (88 patients). Tubotympanic type of CSOM was found to be more common (70%) than atticoantral type (30%). Nearly 45% of the patients presented with right sided tubotympanic CSOM as compared with 35% of patients who presented with disease in the left ear; 20% of the patients had disease in both the ears. In the atticoantral type of CSOM, the laterality was equal on both sides and 30% of the patients had bilateral ear disease [Table 2]. It was observed that time taken for single layer closure was far less (8 min) compared with time taken for multiple layer closure (22 min), which was very much of statistical significance (P < 0.0001, HS) [Table 3]. In group 1 patients, only one unit of 2.0 Ethilon was used (cost: Rs. 140). In group 2 patients, one Vicryl 3.0 (cost: Rs. 238) and one Ethilon 3.0 (cost: Rs. 113) were used. Hence, the total cost in group 2 was Rs. 351 per patient. It was observed that wound dehiscence occurred in four patients in both the groups [Table 4]. These wounds were found to be secondarily infected. Wound infection was defined as discharge of pus from the incision site. Wound dehiscence was defined as gross separation of the wound margins. They were managed with regular mastoid dressings and change of antibiotics as per bacterial culture report. Secondary suturing was not required in any of the groups as the dehiscences were small, less than 2 cm. At the end of 2 months, all patients in both the groups had a healthy suture line and no obvious difference could be made out on the appearance of the wound in both the groups, although one patient in group 1 developed a keloid 1 year after surgery. Theoretically, each layer of the incision should be individually approximated with suture material best suited for it, periostium to periostium, soft-tissue to soft-tissue, fascia to fascia, skin to skin. Periostium and fascia heal slowly, taking up to a year to attain maximum strength. Skin heals faster. Although the actual amount of collagen formed within a healing wound reaches its maximum only 1-2 months after wound repair, many months are required for reorganization. Hence a freshly sutured wound is hardly strong when sutures are removed on 7 th day as is commonly done. The postaural incision closure is more for support, that is, to keep the pinna in position rather than for strength unlike the abdominal wounds. Hence we felt that closure in a single layer may be as effective as closure in multiple layers, which we have proved in this study. The greatest advantages we found in closing the postaural incision in a single layer were: The short time duration taken for incision closure (8 min as compared with 22 min for multiple layer closure). The reduced cost of suture material (Rs. 140 for single layer compared with Rs. 351 for multiple layer closure). In conclusion, single layer closure is as effective as multiple layer closure of postaural incision, with the distinct advantages of reduced closure time and lesser cost of suture material. 1. Capperauld I, Bucknall TE. In wound healing for surgeons: Sutures and dressings. California, USA: Elsevier publications; 1984. p. 75-93. 2. Heughan C, Hunt R. Some aspects of wound healing research: A review. Can J Surg 1975;18:118-26. 3. Brown CD, Zitelli JA. Choice of wound dressings and ointments. Otolaryngol Clin North Am 1995;28:1081-91. 4. Willat DJ, Durham L, Ramadan MF, Bark-Jones N. A prospective randomized trial of suture material in aural wound closure. J Laryngol Otol 1988;102:788-90. 5. Gilmore OJ. In current surgical practice. Vol. 3. London: Edward Arnold Ltd.; 1981. p. 95-108.